Seattle is proposing new rules for cleaning up homeless encampments and evicting their occupants. Facing a lawsuit over its management of unauthorized homeless encampments on city property, Seattle is moving forward with new rules to deal with them. Released Tuesday in draft form, the proposed rules include some departures from existing protocols, such as a provision that would allow the city to identify and potentially fence off areas frequently used as campsites by people living outdoors. There could be up to 10 “emphasis areas,” according to the rules developed for Mayor Ed Murray by Seattle’s Finance and Administrative Services department. “There are places in the city where an encampment has become a persistent problem for a community,” said Chris Potter, the department’s director. Potter pointed to property under Interstate 5 at South Jackson Street as an example of an area that’s been problematic in the past. Removals of unauthorized encampments have been a subject of debate for years. In August, a Seattle Times report detailed widespread bureaucratic failures. 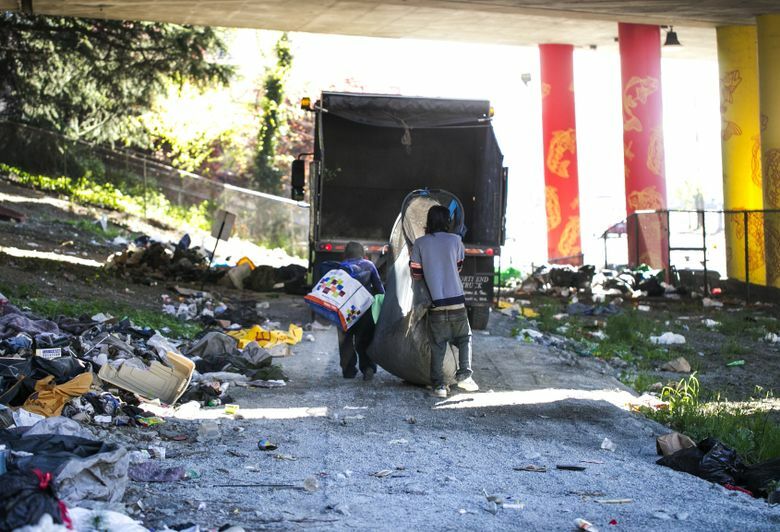 The new rules would allow Seattle to immediately sweep away encampments posing immediate hazards or obstructing the normal use of city property. The removal of nonhazardous and non-obstructing encampments would be prioritized based on various factors, including criminal activity, quantities of debris and proximity to schools and senior homes. The city would need to post notices at such encampments at least 72 hours before taking action and would need to act no more than seven days later. Before cleaning up the encampments and evicting their occupants, the city would need to offer people housing or shelter. Officials expect those provisions to slow the process for removing nonhazardous and non-obstructing encampments and possibly lead to an increased number of them, according to an analysis of environmental impacts. But they expect the provision allowing the city to immediately clear hazardous and obstructing encampments to accelerate those removals, the analysis says. The new rules would cover personal items taken during cleanups. They would give people the option of having items delivered back to them by the city, for example. How Seattle stores and returns personal items is at the heart of a lawsuit filed Jan. 19 by two homeless people. The American Civil Liberties Union of Washington, which is involved in the lawsuit, declined to comment Tuesday. Murray promised reforms last year as the City Council considered legislation written by the ACLU other advocacy groups. The legislation would have added protections for people living outside and imposed more restrictions on the city, and the mayor opposed it, claiming it would lead to more camping in parks. After Murray announced his own plan, the council stopped discussing the legislation. Yurij Rudensky, a Columbia Legal Services lawyer who helped write the legislation, said the new rules would be an improvement. But he said they wouldn’t go far enough. Councilmember Lisa Herbold said several provisions would be positive. But she said she remains concerned about the criteria the city would use to decide which encampments to prioritize for removal.